A copy of this has recently been published! Love the Wood Duck. Holden, B.R. 2016. Harlequin Duck - Great Lakes Population . The Wood Duck 69(6):128-129. The reason I'm putting pen to paper on this topic is due to a recent discussion I had on this increase in Harlequin Ducks in our area in contrast to my disappointment in having not recorded one from my home in Stoney Creek since moving here in 2012. Now, I may be greedy for suggesting I should have seen a Harlequin Duck by now, as they are rare birds... But my place is a bonafide duck bonanza on a normal day (Holden 2014), not to mention that I have the ability to watch active migration throughout the seasons whenever conditions are good. For context, I've seen at least 20 different individual King Eiders in the same timeframe. So where are the Harlies? To try and explain, I'm going to move from the realm of stats and facts into something theoretical. Is it possible that we are on the brink of having a genuine wintering population of Harlequin Ducks, sustaining itself from year to year with augmentation from wandering/vagrant individuals? The eastern Canadian breeding population of Harlequin Ducks was assessed as Endangered by the Committee on the Status of Endangered Wildlife in Canada (COSEWIC) in 1990, and was subsequently down-listed to Special Concern in 2001. Recent assessments suggest a population of roughly 4600 mature individuals (COSEWIC 2013). Dramatic increases to the wintering populations of Long-tailed Ducks, White-winged Scoters, and other duck species are well documented since the arrival of Zebra Mussels (Curry 2006). The Harlequin Ducks small source population could be masking a shift in the species wintering biology from vagrant individuals to a true wintering population. Historically any Harlequin Ducks that reached our shores would not have encountered beds of the invasive Zebra Mussels to sustain them, whereas now, in the 21st century, they find this new and abundant food source and are able to successfully winter. After initial success, the same individuals are encouraged to return year after year, increasing the odds of encountering other individuals of their species. Chance encounters in the fall and winter could theoretically lead to courtship rituals prior to migrating back to their breeding grounds further increasing the benefits of wintering in the Great Lakes. This hypothetical scenario would lead to a gradual increase in numbers, which mirrors the patterns the birding community has been documenting through eBird and other databases. It is also unlike the dramatic swings in occurrence and number for other vagrant species where meteorological events set the stage for irruptions or invasions - leading to wild swings in year to year occurrence and numbers (see Holden 2015). Many Harlequin Duck records over the past ten years in the Hamilton Study Area and beyond have involved one or more individuals wintering at the same site for multiple years - which helps explain why numbers are on the rise, but why the odds of getting that first record for my place in Stoney Creek has not risen correspondingly. If one or more of these theories proves true, we should continue to see a steady increase in numbers and occurrences of the species - an exciting prospect for all local birders regardless of their home address! Curry, R. 2006. Birds of Hamilton and Surrounding Areas. Hamilton Naturalists’ Club. 647pp. 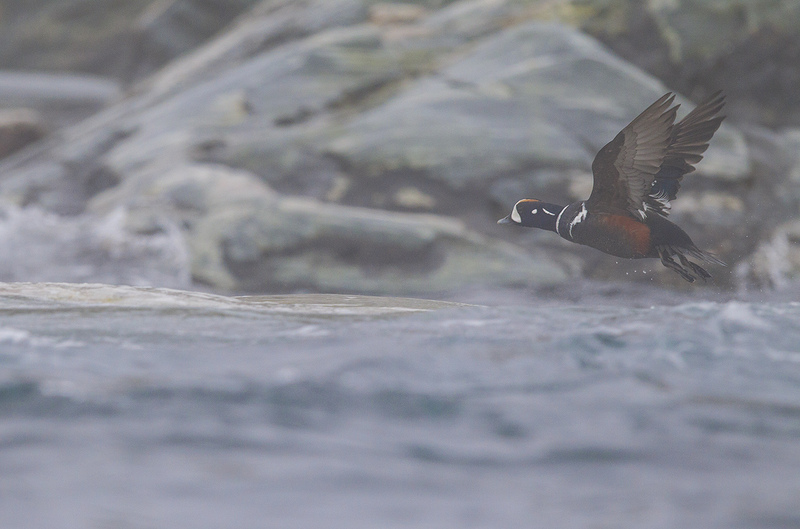 Harlequin Duck #'s have increased big time on the Southern Avalon in the last 2 decades. Cape St. Mary's has historically been the area where we get significant counts - on CBC's in the 80's they were seeing between 50-150. In the 90's it was down to 10-20. Ever since the 90's the population has been increasing. And last year we had a record count of 367!